Poor Advice (And Other Stories) is a zany collection of short stories written by Lou Gaglia. The characters are a mixed group of average Joes and a few Janes with troubles that are reminiscent of characters from a Woody Allen film. Indeed, there is a Woody Allen-ish tone in many of Gaglia’s stories and characters; some of whom are as quacky as they come. Quackiness aside, the stories are also steeped in realism, The characters have jobs, they love, they hate, and they wonder—they think about life’s biggest questions which sometimes appear disguised in ambiguity as well as in absurdity. Gaglia’s fiction is as strange and as real as just about any truth I had related to me in a cafeteria line, bus depot, at a wedding or in front of public bathroom sink by people I know, don’t know (or don’t want to know) that have relatives with names like Uncle Marv and my cousin, Beryl. Gaglia is pitch perfect with character development in the short story form. His name is Sal, and him and his wife—my crazy sister Rita—live downstairs from me and my wife, but you’d think their apartment was just some rest stop since they know their way around my place easier than their own and have become experts at cleaning out the refrigerator. Again, well chosen words and interesting sentence structure that together build a small universe, a hallmark in the short story form. I counted 51 words. This impressed me so much that I thought about diagramming that particular sentence, something that I haven’t done since my elementary years. I didn’t have paper and pencil available at the time as I was inside a pick-up truck driving on a rainy late winter afternoon on Route 84 somewhere in Connecticut south of Hartford, so instead I decided to map it out in my mind and that was more mentally satisfying than any crossword puzzle or sudoku problem that I had ever encountered. Thank you, Lou. This sentence is a favorite: “Glad to meet you, my friend,” he said televangelically. Instantly, I have an image of a man with a smile like that of another man in a pinstripe suit and shiny shoes holding a microphone, standing in front of a pulpit and a rainbow of stained glass depicting Jesus’ crucifixion. Gaglia does this again and again throughout his stories, making this reader pause and wonder and smile. It was almost like reading a script. Moreover, each character has a voice that is individual and unique; their dialogues are terrific, full of colloquialisms and mannerisms and vernacular. In “Hands,” a young man addresses the object of his affection in a letter that reveals much about him bit-by-bit in those winding sentences I mentioned earlier that seem like a one-sided dialogue practiced in front of a mirror. In “Letters from a Young Poet,” another young man goes to Italy and writes home to his sweetheart and once more in “Correspondence” another young lovestruck character’s “positive” and “negative” letters to Karen showcase more word play. Structure is also worth mentioning again. Some of Gaglia’s stories are like an artichoke in this regard. One of my favorite story structures from Poor Advice is “A Teen Tale” where there is a story-in-a-story (ergo, the artichoke). The main character is a writer who addresses three mystery editors in his conspicuously naive and inappropriate query letter, in which the writer-character embeds a story he has written in the main body of his letter. Cool. Gaglia also crafts his stories in multiple points of view: first person, third person and even second person. Second-person point of view is a particular point of view that is not easy to pull off, but Gaglia does it with style and wit. Another element to many of the stories in Poor Advice is this sense of timelessness. The stories take place in the modern world but what decade? ’00s? ’90s? ’80s? ’60s? Maybe it’s the absence of technology in some. Yet one might argue after reading—is technology really missed? I would say: no. There is, however, a strong sense of place. Maybe that is why Woody Allen came to my mind early on. Many of the stories take place in New York—in Brooklyn, in Queens, and on Long Island. It is clear that setting is most definitely a strong motif. Though I’ve never lived in NYC, I’m a sucker for NY stories. Love ’em. After a two inning sampling of my new Brooklyn neighborhood’s little league, my old friend Mike, who I was seeing for the first time since our Long Island days, wanted to sit behind the backstop with the rest of the crowd and study their behavior, but I frowned and looked away, hoping he’d leave it alone, that we’d go over to the basketball courts instead and get into a three-on-three, or watch the old men play bocce. This is the first sentence in “Little Leagues.” And what a sentence. In fact, it’s the first paragraph. The story goes on to see the two characters witnessing an ugly baseball game with Brooklyn parents shouting insults and sarcasm to the umpires, the players, and their coaches. Having attended scores of small town baseball games, I thought I heard them all until now. I think that Lou Gaglia’s stories have a sense of nostalgia which I found to be at the epicenter of the collection—a nostalgia for the people, the places, and good times and the bad ones, too, that remind us of us, our old or other selves. (I miss Queens even though I’ve never been to Queens.) 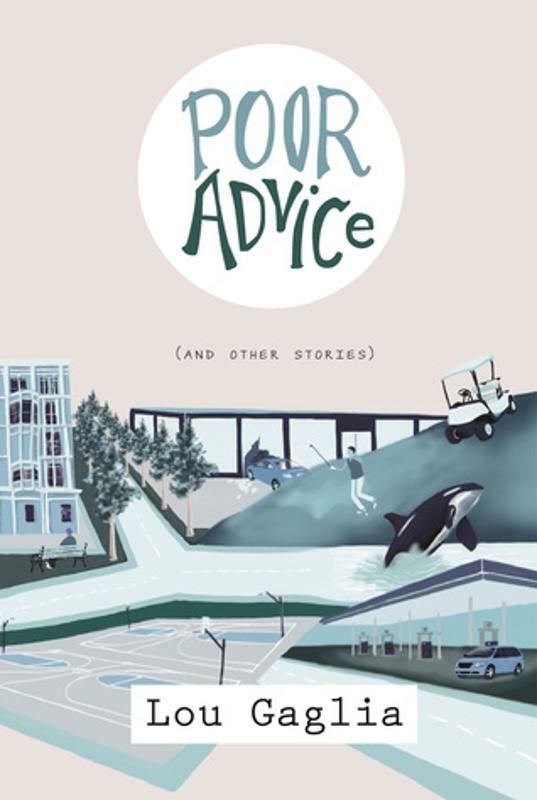 Poor Advice is an imaginative collection of stories for purveyors of the short story form as well as for readers who enjoy a new twist to the postmodern take on existentialism, rich and creamy with nostalgia, wit and humor, and surprise much like Forrest Gump’s box of chocolates. My advice, dear reader, is not to sample Lou Gaglia’s stories, but rather to read ’em all! Lou Gaglia‘s short story collection, Poor Advice, received the 2015 New Apple Literary Award for Short Story Fiction. His fiction has appeared or will soon appear in Menda City Review, Forge, Toasted Cheese, Serving House Journal, Frigg, Halfway Down the Stairs, Rappahannock Review, Thrice Fiction, and elsewhere. He is a long-time teacher and T’ai Chi Ch’uan practitioner, first in New York City and now in upstate New York. This entry was posted in Issue 16:1 and tagged Candle-Ends, Harpspeed, Lou Gaglia, Reviews, Shelley Carpenter by TC Editors. Bookmark the permalink.